Philippa writes about how feminist meetings and events can be made truly accessible to disabled women. Despite it being illegal, and exclusionary, many feminist groups run events which are inaccessible to disabled women. There are arguments put forward about the expense of accessible meeting rooms, but they don’t stand up. If you are a feminist, it is just wrong to hold meetings or events which don’t allow a group of women who are part of a minority group to join in and contribute. Unfortunately what I can’t give you here is an easy checklist of things to do to make your event accessible, although this one is a pretty good start. The thing about impairments is that they really vary from person to person. It is for this reason that you must be really open to hearing the access requests of people who contact your group, or who try to attend. It is also really important that non-disabled group members don’t assume their meetings are accessible, without checking with disabled people. There are some basic requirements, of course. If there are steps, make sure there is also a ramp or a lift. Make sure that doorways are wide enough to accommodate different mobility aids, and that the rooms have sufficient space for mobility-impaired people to move around. Make sure that there are accessible toilets, that these toilets are not full of cleaning equipment, and that non-disabled people don’t use them. You need to be prepared to produce any handouts or leaflets in large print or on different coloured paper. The next most important thing is that you educate yourself so that if you get queries or requests from disabled people, you can answer them. You might be amazed how many times I have emailed somebody to ask about disabled access and just never heard back. I assume that this is because they don’t know the answers to my questions. So, here are some questions you need to know the right answers to, or that you need to know how to find out the answers to, about the building you are meeting in. Can I bring a male PA? If the event is a demo or protest, is there a safe space within the march, or a shortened version of the march available? Are any materials you distribute available in an easy-read format? 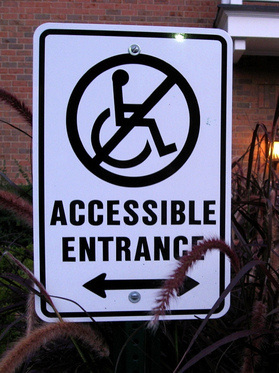 Can a disabled person use the main entrance or do we need to use a different entrance? Has the group had any disability awareness training or information? If a potential new member is anxious about coming, could somebody meet them in advance? If someone needs to sign in or out of the building, what is the height of the reception desk? Is there a designated quiet room available? If you are screening a film, will it have subtitles or audio description? Does the building have strobe lighting? Is disablist language challenged in this group? How close is the venue to public transport? If you get a question you don’t know the answer to, or don’t understand, then do look it up, or find out the correct answer. None of us knows everything, and this is fine. Ignoring the question or giving misinformation is not ok. Earlier today I saw a blog comment asking whether an event would have a quiet space available for disabled participants, and the event promoter recommended a nearby Starbucks. This appears to be an example of guesswork, whereas looking up the concept of a quiet space in the context of disability access would have shown that suggesting Starbucks was really highly inappropriate. If you are unsure what somebody means when they ask a question about accessibility, ask them to clarify. If you don’t know the answer to a question, find the person who does. Nobody expects you to be an expert, what they do expect and require is that you make an effort. Feminist groups who are still excluding disabled women need to seriously question their motivations, and the impact this has on individual women, on a whole group of excluded women, and on the messages they send out about their priorities, their principles and their consciousness and awareness. If you have any more suggestions about how feminist meetings can be made accessible, please let us know in the comments below! I have to disagree with the last bit in the extreme, and the reason why is that though there are a few visible cues for disability, it’s practically impossible to tell for certain who is non-disabled, or doesn’t have a reasonable need for using an accessible toilet. Although encouraging people to only use accessible toilets if they need them in general is sensible, any attempt to actually prevent non-disabled people from using them will likewise harm access for people who need accessible loos. There are plenty of completely invisible reasons someone might need an accessible toilet, as well as reasons why people who have such needs might be sensitive about having to disclose the specific circumstances of that need. It’s just not on to behave that way. Phoebe, I agree totally, and should have expressed that more carefully. I would never suggest any kind of policing which could, as you explain, be very humiliating for people with invisible disabilities or other needs. What I would recommend is that members of the group are all aware of why it is important for non-disabled members to use accessible toilets if they do not need to. So, more of an awareness-raising exercise than a toilet policing policy. This is a comment from @agnieszkasshoes who had trouble posting it. gr8 post. I can’t get twitter to access the comments but 1. excellent about quiet rooms/breaks/anxiety & 2. other things for mental health disabilities include reserving a seat by the door/on the aisle, making sure someone with, say, autism, isn’t cajoled into participating in social aspects/asking Qs they aren’t comfy with. Firstly, I very much enjoyed the post. Thanks! As well as direct/physical access (like ramps, ensuring adequate lighting, toilets, hearing loops, parking) feminist spaces need to also consider indirect/emotional access (like a safe respectful atmosphere). You can have all the ramps and hearing loops in the world but if the environment that’s been created is hostile (even indirectly) because of disablist language, constant “what’s wrong with you?” questioning or the ignoring disabled voices then I would suggest it isn’t accessible. I completely agree that using accessible toilets when it’s unnecessary is selfish and unfair. But, I think there is often a wider underlying problem, where there is an assumption that venues offer sufficient toilet provision for people who don’t have disabilities. But, this is just not true. Indeed, I’ve been to many venues that have one accessible toilet and one non-accessible toilet, or the prevalent model in small venues, which tends to be one accessible toilet and two non-accessible toilets. And, this can mean that people have to queue for significant lengths of time and are driven to use accessible toilets from necessity. And, I get that this might seem like a petty complaint, but I’ve been forced to leave venues and urinate outside (illegally!) because I could no longer wait and that was less humiliating that wetting myself in a queue of women. So, I guess I feel that painting the non-disabled user of the accessible toilet as a miscreant is problematic. I also think that this borders into being a disability rights issue given that between 20 and 50% (depending on the study) of women suffer from some form of incontinence, especially as they age or as a consequence of pregnancy and childbirth. So, I’m not why it’s not acceptable for accessible toilets not to operate as an overflow for non-accessible provision when necessary. Although this relates to a whole range of issues, not just disability, another thing to think about in terms of accessibility is where your events are advertised and how members of feminist groups can communicate with each other. If it’s all online or all on Facebook, a lot of women will be excluded. Thanks for this post Philippa – bookmarked for the next event I’m involved in! A lot of good things in this article so thanks for writing it and starting a discussion. * Loop systems may be present but are the microphones used wired into them. Are they on and working? 86% of public loop systems did not work in a 2008 RNID study and that matches my experience of trying to use the wretched things. Can you find a pet hearing aid user to test them (it’s almost impossible for a non professional hearing person to do it, and even the pros sometimes don’t test well). Be honest if you haven’t been able to test it. * Electronic copies of materials. Word is often easier than PDFs. Many blind and partially sighted people cannot read braille, whereas most braille users can and will be happy to access (accessible) electronic documents if they can be provided with them on the day or in advance (think about how the user can access it from a mobile device like phone or tablet). This is also a low cost/no cost solution. https://support.office.com/en-gb/article/Make-your-Word-documents-accessible-d9bf3683-87ac-47ea-b91a-78dcacb3c66d but there’s loads of things if you search for the relevant software and accessibility as all the main platforms do it now! Keep things as standard as possible. * Many deaf people do not use BSL and speech to text reporting (STTR) (also known as palantypy) a form of realtime captioning or summary eletronic notetaking are both more expensive and difficult to book as there are only 25-30 providers in the UK who are often booked up. Software does not understand speech well enough to work so that really isn’t a sensible option most of the time. Where communication support can’t be provided (I know it isn’t easy as a user of it!) then other things like printing names of speakers, order of speakers, topic of speeches and any notes or scripts of speeches are helpful, reserve space at the front for people so they can hear/lipread. This also benefits others who may struggle with auditory processing or anxiety as they know what to expect. Regardless of communication support: Get ALL speakers to use microphones (and don’t let people avoid it) and ask people not to YELL into the mic either… It is useful if people can use the mic in a way which doesn’t obscure their face but that’s into wishful hoping! :) If questions are asked from the crowd, if speakers can summarise what was asked this is REALLY helpful. Teach people good mic technique. In terms of venues, information is power. Tell people what the venue is like in advance. Take pictures – show us! No venue will be perfect, be honest about the failings. If (when) you can’t always find an ideal building, then mix and match venues for different events. Some venues might be wheelchair accessible but too loud or badly lit for others. Lighting and acoustics are things which affect many people but are hard for those not affected by problems to detect. Seek volunteers who struggle to help you identify problem areas. Be honest about how planned or structured an event is. Sometimes even the best laid plans will change, if that happens, fess up as quickly and clearly as possible, have contingency if possible to deal with that. Maybe a volunteer to provide extra assistance to those affected. If a venue’s screwup affects disabled people, offer to help them make a complaint (legally only a disabled person can raise legal/formal complaints) as part of the organisation so the venue knows not to screw up again.